Macaws are not a single species; instead, there are a group of genera within the family of Psittacidae, the true parrots. Macaws have large beaks, bright feathers, long tails, and light or white facial patches. Macaws are big, sociable, and extraordinarily noisy. They also require a good deal of space to live healthy, active lives. Many macaws are included in wills and end of life plans since they often outlive their humans, though some common diseases and poor nutrition can drastically shorten these anticipated lifespans. Macaws are large, colorful South American parrots. So-called "New World" parrots have been known to Europeans since the 1400s, as Columbus mentioned them in his logs. Most species of macaws are endangered and a few (such as the Spix's macaw and glaucous macaw) are almost certainly extinct. Problems faced by macaws in the wild include deforestation (loss of habitat) and illegal trapping. While most macaws are captured for the pet trade, some are also captured and killed for their beautiful plumage. In recent years, ecotourism has focused on the bird life of the South American rainforest. Some conservationists hope that tourist dollars will make it easier to conserve macaw habitat and lower the rate of trapping. The larger macaw species range from about 20 inches (military macaws) up to 42 inches (hyacinth macaws) including their long tails. Mini macaws are more manageable at 10 to 20 inches in length but all species of macaws need very large enclosures to stretch, and ideally, fly. Some macaw lifespans range from 30 to 50 years if not more. Mini macaws have a lifespan at the lower end of this range while a healthy large macaw can be expected to live 50 years or more with good nutrition and care. Macaws are playful and active and they have exuberant personalities to go along with their sizes. But this also makes them very challenging pets. Macaws that are not regularly handled or have hormonal imbalances, drastic environmental changes, or little mental stimulation can become aggressive, territorial, destructive, and problematic. A well-cared-for macaw that receives appropriate nutrition, mental stimulation, and enrichment, attention, and space makes a unique, long-lived companion that is very affectionate and loyal. Macaws are loud and noisy. Their vocalizations can be more than some people can tolerate and they can scream when they want to. They do have the ability to say words and mimic our speech but it is not as clear as some other pet bird species. If you aren't prepared for noise then a macaw is not your ideal pet. Because they are so intelligent, macaws can be trained. 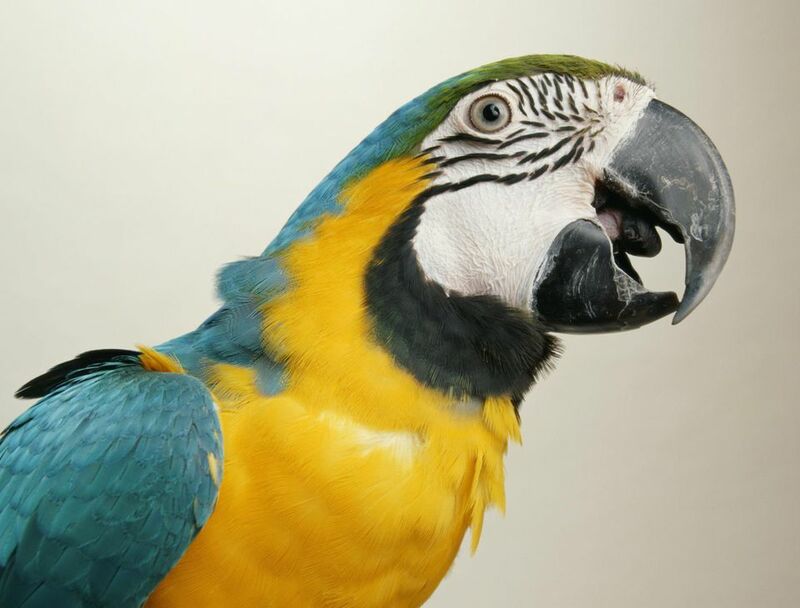 You can start when your pet is young, and work on hand-feeding, teaching your bird to talk or sing, and training your macaw not to nip, bite, or scream in your ear. You may also discover that you and your macaw can actually share jokes and enjoy various types of interactive play. There are several species of macaws in the wild but the ones most commonly seen in the pet trade are large colorful macaws. Scarlet macaws, blue and gold macaws, military macaws, and hyacinth macaws are common pet macaws because of their colorful feathers. Mini macaws are harder to find but include species such as Hahn's, noble, and yellow collared macaws. Most pet macaws are bred for the pet trade, which means they are likely to bond quickly with their human friends. Macaws need a large and durable cage so be prepared to make a significant investment. Mini macaws can be kept in a cage sized for Amazons (24"x36"x48") however the larger macaws need a cage of at least 36"x48"x60". The cage must be strong enough to withstand the significant beak strength of macaws, so a stainless steel cage is a good investment. Any macaw cage is meant to keep your bird temporarily contained and safe (usually just at night or when you are not home), not for them to live their lives out of. A wide variety of wooden toys or plain, untreated chunks of wood to chew on should be provided on a rotating basis to your macaw. Toys meant to be taken apart to get at a treat are also a good choice, as are hanging toys and toys to climb on. Macaws can be messy and destructive so heavy duty toys should always be provided so your bird doesn't find something else to chew on. Many owners opt to make their own macaw toys and utilize recyclable, yet safe, materials such as phone books and tissue boxes. Start with pelleted food as the basis for your macaw's diet and then supplement it with a wide range of healthy fresh foods (grains, vegetables, fruits, etc.). Pellets should make up 25 to 50 percent of the diet, seeds should be no more than 10 percent of the diet (as they are too high in fat), and the rest of the diet should be fresh healthy foods. Many people will offer their macaws a small portion of whatever they are eating, as long as it does not include any chocolate, caffeine, salt, or sugar (favorite items include cooked pasta, applesauce, and cereal). Nuts should be reserved as a treat. Macaws need much more room than a cage will provide in order to explore, spread their wings, and be mentally and physically healthy. Unless you have a free-flight aviary as a "cage" plan on your macaw spending more time outside of their cage than in it. Birds are flock species and are also very affectionate so they require a good deal of time and attention from their owners or another bird to be happy. Macaws are usually hardy, long-lived birds. Their most significant health issue is not physical but emotional: as intelligent, social beings, macaws are prone to boredom and loneliness. A depressed macaw will self-injure by pulling out its own feathers. There are two simple solutions to this problem: either own more than one macaw, or spend a great deal of time interacting with your pet. Either way, you will have a loud, highly interactive home life! To ensure your pet's health, find a local avian vet with who you can build an ongoing relationship. Your pet should visit the vet regularly to check for any signs of disease or depression. Before purchasing a macaw do your research to select the breed that's right for your home and lifestyle. A smaller bird needs less space, but a larger one is magnificent and can become a friend for life. If you don't have the space for a large bird, don't buy one: the chances are good that it will have a hard time living in your home. Macaws are often available in pet stores, and older birds are often available for adoption. You can also purchase a macaw from an avian breeder. Be sure, before you buy, that you have a chance to meet your prospective pet. Be sure the bird you choose is bright-eyed and healthy with full plumage; spend some time together to be sure you are a good match. Remember that a macaw can be a pet for a lifetime, so make a fully informed choice.